WTV (i.e. Windows Recorded TV Show) is a file container format the Windows Media Center use to store recorded TV content. WTV files can be played only on very few media players like Windows Media Center and be supported by hardly any video editor. So, if you want to play WTV in Windows Media Player, edit WTV in Adobe Premiere, or import WTV to some AVI supported devices like Xbox 360, PSP, etc, you will need to convert WTV to AVI for more convenient playback and wide uses. It'll be an easy job if you find a powerful and easy-to-use WTV to AVI converter for help. However, there is few good quality video converter that allows you to import WTV files to convert. Here, I directly recommend Wondershare UniConverter (originally Wondershare Video Converter Ultimate), which has been upgraded and supports WTV input now. 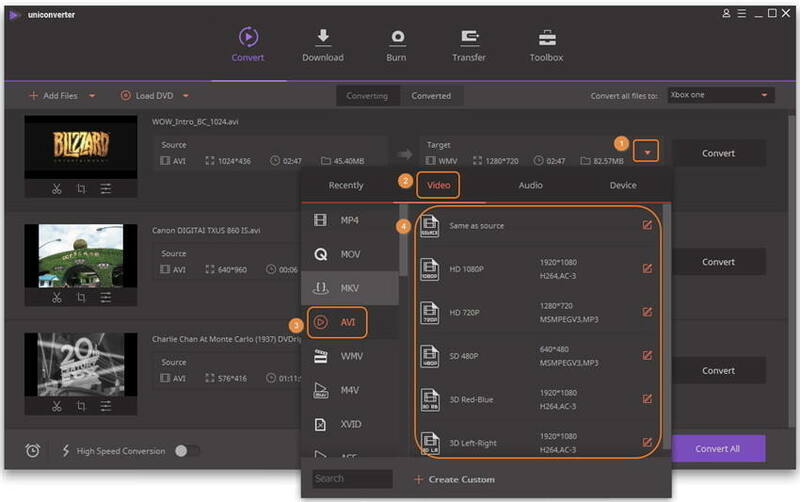 With a few simple clicks, you can convert your WTV recordings to AVI in high video quality. What's more, not only AVI but more optimized output formats are provided by this app as well. It means you can quickly and easily convert WTV files to fit these programs best, including Apple devices, Blackberry, Game hardware, Archos and Creative Zen, etc. This following tutorial will walk you through four steps for converting WTV format to AVI format. Open this app, and then click Add Files icon of the main window to load the WTV videos you want to convert. The other way you can import WTV files is to simply drag them to the program window. After you import WTV files, they'll display in the left item tray of the window as video thumbnails. Note: If necessary, you can change the file name or preview them by clicking the video thumbnail, or merge them into one file at the moment. Click the down arrow button from the Target box and select Video tab, choose AVI in the left sidebar and select the video resolution in the right to confirm the output format. 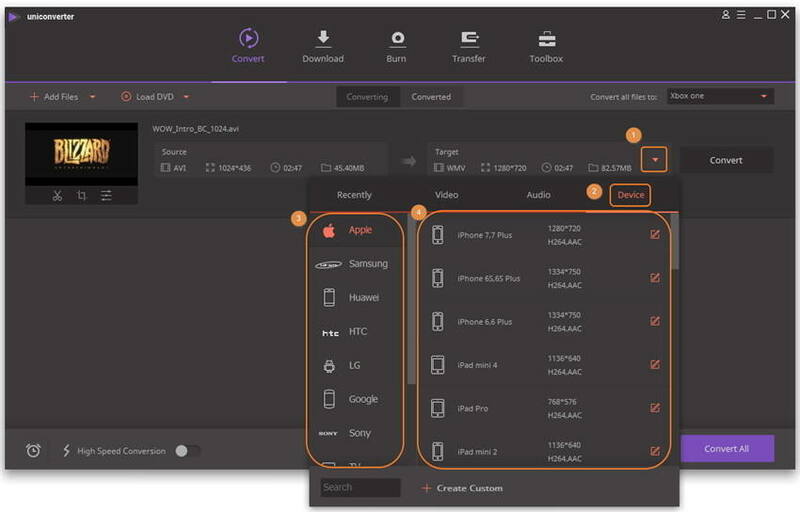 If you want to watch them on some AVI compatible device, you can also go to Device category instead, and then choose the device as the output format. This app includes an optimized presetting for almost all popular devices. Tips: This app also allows you to set other video parameters like video codec, frame rate, resolution, bitrates etc. To do it, just click + Create Custom option at the bottom of the output format list to access setting window. If you convert WTV files just for editing, you can directly do some editing jobs in this WTV to AVI converter. 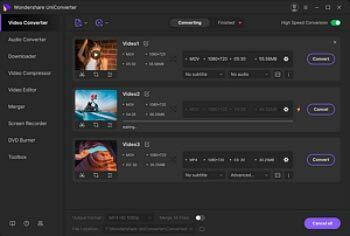 For example, you can trim video, crop video, merge multiple videos into a big one, or set video brightness, contrast, and saturation. To do it, just simply click the editing icons under the video thumbnail in Step 1 and choose the corresponding option you want. Click the Convert button to kick off the conversion. This app can run in the background, so you can do other jobs without being disturbed. After conversion, you can make full use of these converted video files now. And the converted videos are saved in its Output Folder. Just switch to Converted tab to find them and then import to the application you want to play. For devices, you need to transfer the converted files to the devices via cable.